This week I've moved on to start painting the minis legs and it's been a much more positive experience than the one I had painting the head. Before I could start on the armour I had to tackle the under suit and initially it looked as if my painting troubles were still be following me. Working up from a base of scorched brown I highlighted by adding an increasing amount of Rakarth Flesh. The colour was good but became a little too pale and slightly dusty looking. 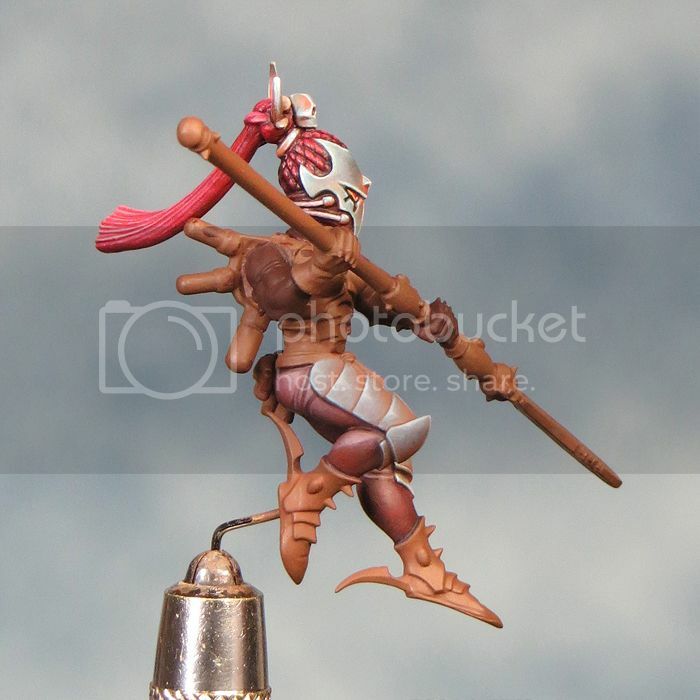 It was (I thought) a simple fix with a glaze/wash using some of the new Citadel shade colours. 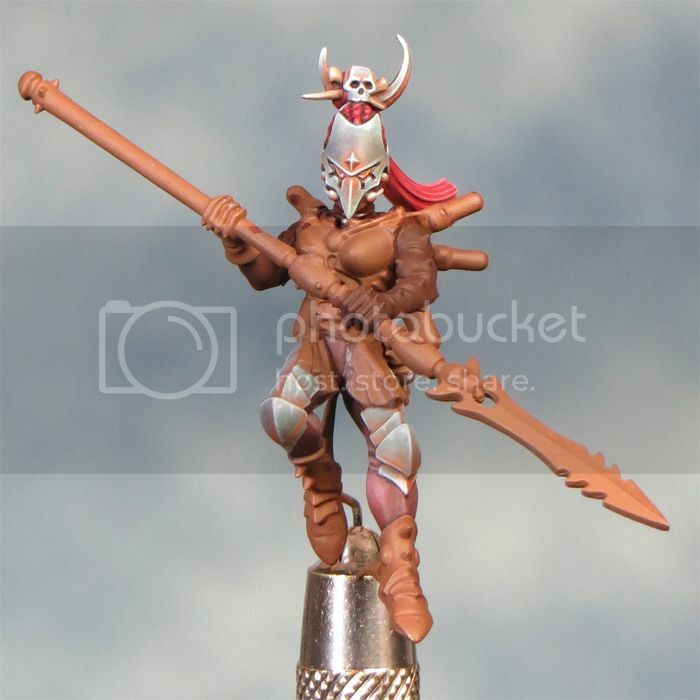 Unfortunately, unlike the old citadel washes, these colours dried on my mini with a shiny finish and looked horrible! That was unexpected and a major disappointment. 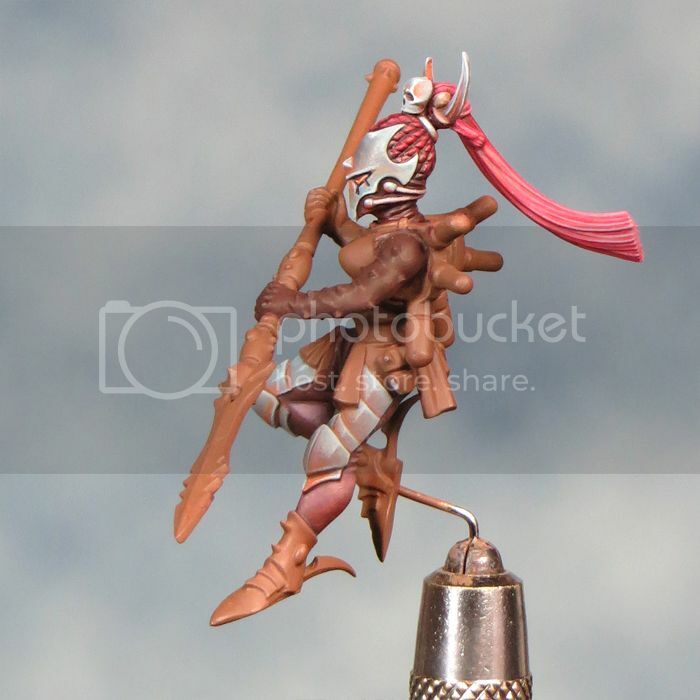 I shall have to experiment with washes to find where I can get the best matt finish. Luckily I had saved a small amount of some of the old washes and was able to sort the problem. With the under suit painted I could begin painting the armour plates. The initial highlighting is fairly speedy, working up with increasing amounts of Adeptus Battlegrey added to the Calthan Brown base colour. This acts as a sort of underpainting for the blue,grey and orange tones that give the colour palette a more nuanced feel. This stage can be a fiddly business and requires a fair bit of going back and forth between colours and tones but it's worth the effort. After that it's a matter of keeping the highlights fine and sharp.